Four men from Mississauga and Brampton are facing serious charges after drugs – with a street value of more than $20,000 – and a gun were seized from an Argyle Rd. home. Peel police’s street crime gang unit executed a search warrant at the Cooksville home – near Hurontario St. and Dundas St. W. – on Nov. 2, confiscating a .32 caliber Beretta handgun, an unknown quantity of ammunition, and a bulletproof vest. 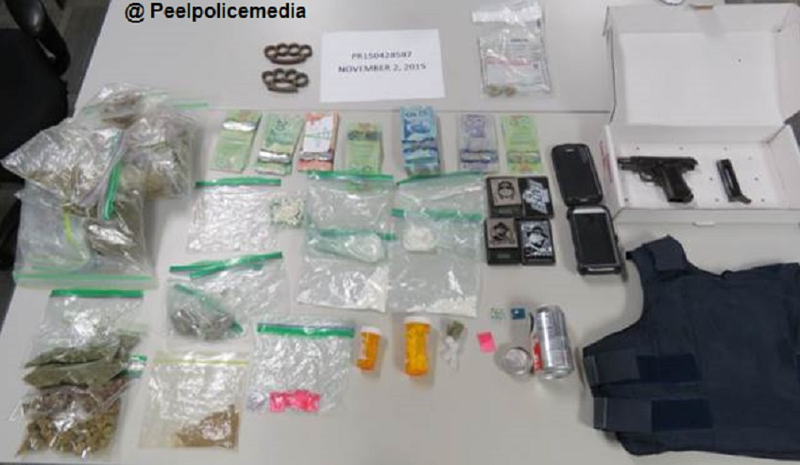 Marijuana, cocaine, oxycontin, percocet, heroin and MDMA were also seized, with police estimating the street value at $20,322. Patrick Mroz, 25, of Mississauga, is facing 18 weapons and drug related charges. He appeared in Brampton court on Nov. 3 for a bail hearing. Kamil Rozenek, 27, and Dominik Bryczynski, 23, both of Brampton are charged with possession of a controlled substance – cocaine, and possession of a controlled substance – marijuana and are scheduled in court Dec. 17. Zdzislaw Mroz, 55, of Mississauga, is charged with possession of a controlled substance with a Jan. 7, 2016 court date. Anyone with information related to illegal drugs or firearms can contact the investigators at 905-453-2121 ext. 7704 or Crime Stoppers at 1-800-222-8477.